MARIANI FOODS, NSW: AUSTRALIA – Dehydrator performing well! MARIANI FOODS, NSW: AUSTRALIA – Beef Jerky Dehydrator performing well! Mariani Foods report that the GTD Food Dehydrator is performing well, producing premium Australian beef and game jerky. 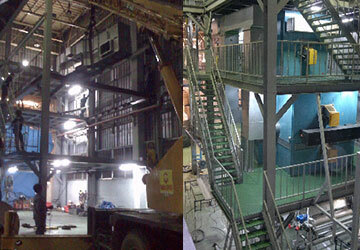 The stainless Food Dehydrator was commissioned at the Mariani Foods’ Casino, NSW premises during the morning of 22/9/2011, and was producing quality jerky by that afternoon. The Food Dehydrator is of GTD ‘food-grade’ design, featuring full stainless steel construction, fully welded internals, and food grade silicon door seals and gaskets. 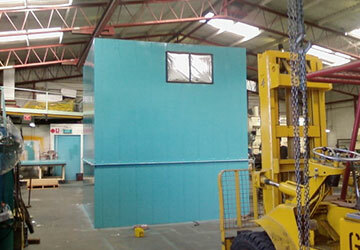 Large entry doors are fitted at either end of the Dehydrator allowing trolleys of prepared beef to enter from one side of the Dehydrator, and the finished product to be extracted from the other. Temperature control is achieved via a PID instrument controlling a LPG fuelled gas burner. Humidity is controlled via a series of automatically modulating dampers, whilst the air flow is controlled via Toshiba variable speed drives linked to twin stainless steel fans. This dehydrator also features the GTD ‘Air-Reversal System’ which reverses the air flow through the Dehydrator to ensure an extremely consistent dehydration process resulting in product of a very high standard. Mariani Foods is the leading producer of nutritious and tasty premium Australian beef and game jerky. 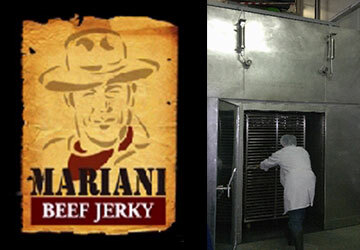 Supplying superior beef jerky for over 30 years, Mariani uses only the finest quality Australian beef. 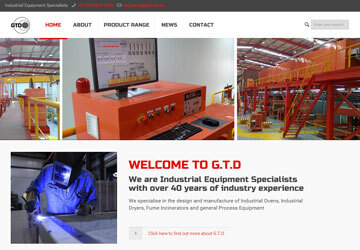 Industrial Equipment Specialists boasting over 40 years of industry experience. © 2015 GTD Industrial Ovens. All Rights Reserved.